Laid to Rest is a 2009 direct-to-DVD horror movie that you’ve never heard of unless you’re the kind of person who subscribes to Fangoria and once wrote to Tom Savini requesting an autograph. It’s a slasher film for slasher fans, a blood and guts special effects showcase. It’s also something of a family affair. Bobbie Sue Luther produced the movie. She also serves as the female lead. Luther is married to the special effects expert who directed the movie, Robert Hall. You can bet your severed head that its makers weren’t worried about whether the general public would fall in love with it. They just wanted to appeal to its micro-niche. It looks like they did a good job. A perusal of the surprisingly large world of slashercentric blogs reveals generally positive reviews of the movie and a great deal of appreciation for its spree-killing star character. 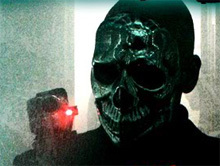 The killer villain of Laid to Rest is the highly stylized Chrome Skull, who as his name suggests, has a face covered by a chromed skull mask. He also has two big chromed blades that look like what the twin gynecologists from Dead Ringers may have owned had they taken gear to the guys at West Coast Choppers for some pimpin’. Oh, he also has a little video camera mounted to his shoulder with a glowing red light. The plot involves an amnesiac girl who escapes from a coffin just in time to flee Chrome Skull. She seeks help from good-hearted but incompetent people. Chrome Skull kills several of them. A few of them survive until the final credits, including the protagonist scream queen. Chrome Skull appears to die, but we all know better. Two sequels are already in the works. If you have delicate sensibilities, you’ll never consider picking up Laid to Rest in the first place. If, on the other hand, you love incredibly gory kill scenes, Laid to Rest may become one of your all-time favorites. The movie basically exists to take us from one act of butchery to another. I don’t know if you can actually call the murders realistic, because I don’t know as if anyone has any idea what some of these creative bloodlettings would look life in real life. I can tell you that you will see eyes filling with blood, entrails and even some face skinning. If that’s your thing, this is a five-star effort. I’m not easily offended and I’m not a slasher aficionado. I’ve subjected myself to so much stupid crap over the years that I’m desensitized to the slaughter action. Though I’m not squeamish, I don’t really enjoy bloody mayhem for the sake of bloody mayhem. With that in mind, here’s a quick explanation of why Laid to Rest is, by reasonable standards unrelated to the buckets of faux innards used in the production, a crappy movie. Chrome Skull may have a look that’s appealing to the gorehounds of the world, but no one ever bothers explaining much, if any, of his back story or motivations. Classic movie killers like Freddie, Michael and Jason captured the public’s interest and scared folks, to at least some extent, because they had at least some messed up rationale for their non-stop killing ways. Lacking that, Chrome Skull is just a boring, unexplained robo-man with a creepy mask. The stupidity of the non-killing characters reaches a level that far exceeds the average slasher flick victim. These movies only work when characters make bad decisions, but the characters of Laid to Rest make unfathomably stupid calls at every turn. Laid to Rest is poorly written, poorly edited or both. Ideas and little features that seem to have potential relevance to the story go nowhere. Trust me when I tell you that they’re not meant to be that way. There are only two potential reasons you might care even slightly about the fate of anyone in the movie. You might want someone to make it to the end so you can learn more about Chrome Skull or you might find the lead actress attractive. As noted, Chrome Skull remains a dull mystery and Bobbie Sue Luther’s good looks aren’t a point of emphasis. Laid to Rest isn’t scary. It isn’t interesting. It isn’t much of anything other than bloody. If you need a gore fix, watch it. Otherwise, steer clear. Note: This is the second in a series of pre-Halloween movie reviews. You might want to check out the review of Jeepers Creepers, too.